The context of my work is the simulation of real human activities in immersive virtual environments. I am interested in the question of human realistic response in virtual environments which i define as the similarity of human behavior in an activity that is performed in a virtual context, compared to the real activity. I point out immersion as the nature of the interfaces of the virtual reality system. This document is a synthesis of my work whose objective is to seek immersion modalities that enable realistic response. 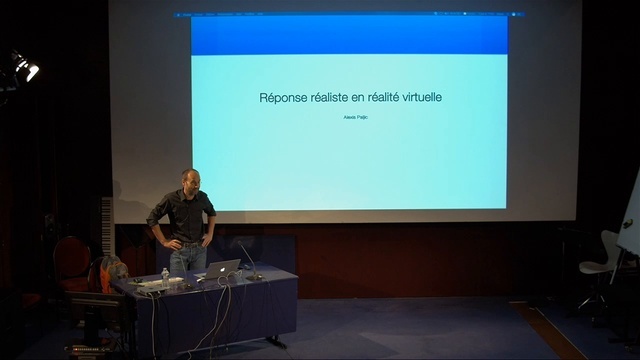 Realistic response is a central question to the study of human ecological activites, for which the predictive nature of virtual reality is the very reason for its use : the design of objects or working stations before the existence of actual prototypes, or the objective evaluation of the activity in the therapeutic context. My research method is based on the comparison between the virtual and the real, using objective and subjective criteria. My contribution is to establish the descriptors of human activity for which human response is realistic, those for which it is not, and secondly explore the reasons for these results and open research towards potential solutions. I present four different activities : observation of materials, observation of shape and size of objects, gestures when manipulating objects, and finally human-robot cooperation.